Good morning! 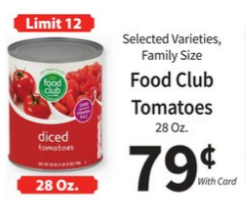 Food City has a great sale on tomatoes through Tuesday. The 28 ounce cans are only 79¢ with a limit of twelve cans. There is a big variety available. I made sure to pick up my twelve cans this week. 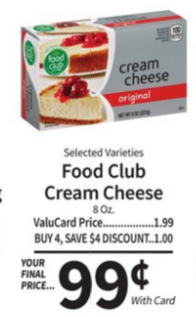 They also have cream cheese for 99¢ and one dozen eggs for 49¢. You will have to buy four items to get the sale price, but you can mix and match. 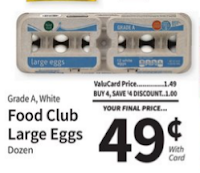 I bought four dozen eggs and four cream cheeses. On Saturday, I made Cauliflower Taco meat for dinner. This is the second time I have made this recipe from Brand New Vegan. As with most recipes, I did change some things. I didn't have any mushrooms either time, so I simply left those out. Last time I used all the spices involved, but this time I just added taco seasoning mix and smoked paprika. I also used Worcestershire sauce instead of soy sauce because that is what I had on hand. Also, I wanted a Mexican type dish and I think soy sauce would make it more Asian. I think this would be a very versatile recipe too. I could see adding chopped up potatoes, which I do with ground beef for tacos, would be a great addition. I also think black olives would be a good addition. Preheat oven to 350 degrees. Remove the core from the cauliflower and cut up into small pieces and wash. Pulse in the food processor until you have a rice like consistency. Place in a mixing bowl. Pulse the mushrooms in a food process until you have a rice like consistency. Do the same with the walnuts. Stir in the soy sauce and spices and mix well. Bake for 45 minutes stirring about half way through. My daughter loves this dish already. She has even eaten it cold right out of the fridge. I love that fact that it is plant based and healthy. When I was hand washing the dishes after dinner I loved that fact that there was no grease on any of the dishes like there is after we've had tacos made with ground beef. I have a busy week ahead of me as I am working everyday. WOW! some screaming deals at the store! I would have dragged my Mom and my DD along to get an additional 24 cans. Great finds! We are going to have to try the cauliflower. Thanks for sharing the recipe.